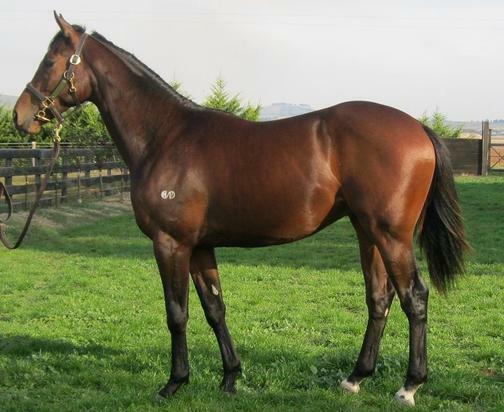 A colt by Champion stayer and Melbourne cup winner Fiorente out of the well bred Sensually an unraced Fasliyev mare. FIORENTE was the leading candidate for Horse of the Year honours for 2013-14, he has demonstrated top-class form over a remarkable range of distances. A Group One performer from 1400m to 3200m, he is a Group scorer at 1600m, 1800m, 2000m, 2400m and 3200m. Fiorente is one of the most outstanding sons of the great stallion Monsun. A four-time Champion Sire, Monsun has been represented by Group One winners in Australia, North America, England, France, Germany and Italy. He is also rapidly beginning to make an impact as a sire of sires. He is SUPER VOBIS Nominated and eligible for VOBIS GOLD as well as the INGLIS race series. FIORENTE (IRE) (Brown 2008-Stud 2014). 6 wins from 1600m to 3200m, VRC Melbourne Cup, Gr.1. Out of a half-sister to SW Hyblon. Sire of SW Hawkshot (MRC Autumn S., Gr.2), Stars of Carrum and of Fariha, Gee Gee Fiorente, Lunar Flare, Mangione, Piemonte, Convict Sam, Alessandro, Wham, Continuation, Floriano, Lord Gladstone, Mannza, Moor Gait, Over de Top, Shandy, Spensierato, Vigere and of the placegetters Fiorente's Girl, Power Scheme, etc. His oldest progeny are 3YOs. Act Two (f. by Artie Schiller). 2 wins-1 at 2-at 1000m, 2d MRC Maxie Howell H.
Cash Dash - Chung Wah Spirit (H.K.). 5 wins-2 at 2-from 1200m to 1650m, A$21,900, HK$3,698,825, to 2018-19, BRC Moet & Chandon Chairmans Club 2YO H., HKJC Cox's H., 18 Districts Cup, Yan Oi Tong Cup, 2d HKJC Tin Shui Wai H., Oak Maritime H., Merlion H., Mr Award H., 3d HKJC Mody H., Collection H.
Teringa. Winner at 1300m, 2d VRC Misting H., 3d VATC RSL H., Courtza H.
The Raven. 2 wins at 1200m, 1300m in 2018-19 in Aust. MY FLASHING STAR (Snippets). 3 wins. See above.